Bob Aves is a stalwart in the international world music scene. This award winning composer graduated from the prestigious Berklee College of Music in Boston, yet is a champion of the Filipino indigenous sound. He co-established Tao Music, an all-Filipino record label that specializes in traditions and contemporary culture- based titles of Philippine Music. Needless to say, Bob's music has been featured world-wide through international music festivals, such as the 2006 Festival Asia in Spain and the 2011 Penang World Music Festival in Prague to name a few. The Bob Aves Jazz Group has performed in various jazz festivals such as the Zhujiajiao Water Village Music Festival in Shanghai, and the Jarasum Jazz Festival in Korea, among many others. The concert will feature musicians Dix Lucero (Saxophone), Nikko Rivera (Keyboard), Tusa Montes (Kulintang), Colby De La Calzada (Bass), and Harald Huyysen (Drums). 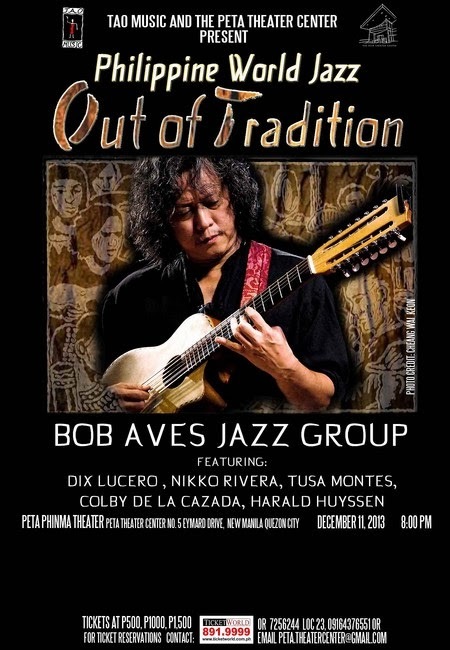 Do not miss this rare opportunity to intimately experience the unique sound of Philippine World Jazz! Tickets are at P500, P1,000 and P1,500.